now has turned her attention to the scented air wafting from household laundry vents. "Air vented from machines using the top-selling scented liquid laundry detergent and scented dryer sheet contains hazardous chemicals, including two that are classified as carcinogens." "This is an interesting source of pollution because emissions from dryer vents are essentially unregulated and unmonitored," said lead author Anne Steinemann, a UW professor of civil and environmental engineering and of public affairs. "If they're coming out of a smokestack or tail pipe, they're regulated, but if they're coming out of a dryer vent, they're not." "Analysis of the captured gases (from dryer vents) found more than 25 volatile organic compounds, including seven hazardous air pollutants, coming out of the vents. Of those, two chemicals -- acetaldehyde and benzene -- are classified by the Environmental Protection Agency as carcinogens, for which the agency has established no safe exposure level. "These products can affect not only personal health, but also public and environmental health. The chemicals can go into the air, down the drain and into water bodies,"
There is no need for using toxic laundry products. Using these products not only contributes to environmental pollution, but can also affect your own health. Sleeping in sheets, wearing clothing and drying in towels coated with these chemicals are harmful to your health, especially the health of your children. Pillowcases laundered in conventional toxic laundry products can irritate conditions such as acne and eczema. You can have fresh safe fabrics by simply laundering your clothes in economical natural products such as a good liquid castle soap, baking soda, vinegar and peroxide for stains on light clothes. Natural laundry products are readily available and often cost less than conventional toxic ones. Purchasing a good front-loading washer can also reduce the amount of laundry products needed. The water jets do a good job on their own in cleaning less soiled laundry. A reusable dryer sheet can eliminate static without toxic residue being left on your clothes. 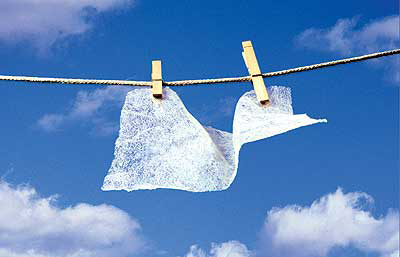 Read more about the toxins in dryer sheets. Why "clean" your laundry with chemical gunk? If you want clean fresh laundry, purchase safe clean laundry products. It's the right thing to do.